Ever in a hurry and need something wholesome, homemade, and delicious… yet easy to grab and go? I keep these healthy oatmeal cookies stocked in our freezer for my husband. He uses them for breakfasts on-the-go and snacks when he gets home from work. We throw them in his lunches, and yes, he definitely grabs one after dinner pretty often, for dessert. Whether for breakfast, snack, or dessert, these nourishing cookies will serve you well. Chocolate Chip Breakfast Cookies keep beautifully in the fridge or the freezer, depending on how many batches you make and how fast you eat them! Cooks who soak their grains are a lot like gardeners. We’re tending to the pH of our “soil”, encouraging enzymatic changes and trusting in a process we know is happening inside the grain. While soaking oats will never yield a visual sprout, we can be sure a transformation is happening. In the case of this dough, whey (or apple cider vinegar for dairy-free) helps reduce the phytic acid and other anti-nutrients in oats. There's no extra work involved in adding this acidic ingredient to the cookie dough ahead of time, but it boosts nutrition! When oats go through some form of pre-digestion, in this case the overnight soaking, they become a healthy gluten-free grain. My favorite thing about oats is the soluble and insoluble fiber in them! Oats not only promote regularity, oats are great for the digestive tract because their fiber increases our gut diversity (our microbiome feeds on oats). (Source.) For more about the benefits of fiber, check out this article. Oats are also high in vitamins, minerals, and antioxidants (source). If you wish to break down the oats’ anti-nutrients even more, you can try substituting half of them with ground buckwheat groats. For best flavor, buy them whole and grind them yourself with Wardee's favorite home grain mill, the Mockmill. I haven’t tried substituting half of the oats for buckwheat yet, but I like the idea and plan to. Buckwheat contains an enzyme which oats lack (phytase) that helps to break down phytic acid (source). Protein & Prebiotics Make These Cookies Healthy! In addition to soaked oats, Healthier Chocolate Chip Breakfast Cookies’ nutrition comes from their protein content and prebiotics! Because these cookies are meant to provide a healthy but fast breakfast, they contain several sources of protein: eggs, tiger nut flour, and collagen. Need something wholesome, homemade, and delicious for kids and busy families... yet easy to grab and go? 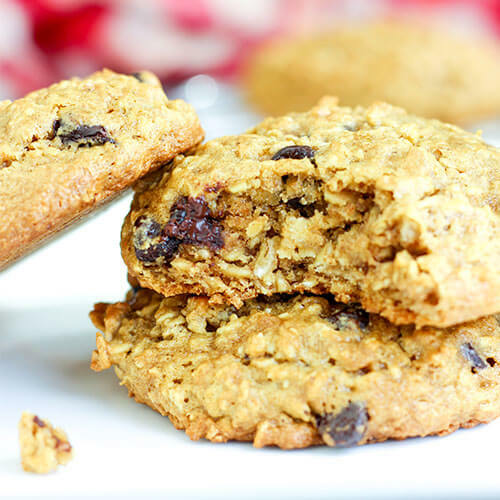 Enter these Chocolate Chip & Oatmeal Breakfast Cookies, made with soaked oats and three sources of protein (eggs, collagen, and tiger nut flour) so they are as healthy as they are simple! Use coconut oil instead of butter if you need dairy-free... and add gluten-free oatmeal breakfast cookies to your healthy recipes repertoire ASAP! In small pan, melt butter over low heat. Remove from heat. Stir in coconut butter and maple syrup. Set aside to cool slightly. In mixing bowl, combine rolled oats, eggs, melted fat mixture, and whey or apple cider vinegar. Leave on the counter for 4 hours if time allows. Then cover and refrigerate. Let soak overnight, up to 24 hours. In the morning, preheat oven to 350 degrees Fahrenheit. In small mixing bowl, stir together remaining dry ingredients: tiger nut flour, collagen, cinnamon, baking soda and sea salt. Scoop cookies into approximately 3-tablespoon mounds. I use this cookie scoop. Bake in preheated oven about 15 minutes, until bottoms and sides of cookies are golden. *All of the ingredients need to be room temperature or warm. This keeps the coconut butter runny (otherwise it thickens and solidifies) and also helps to jump start the fermentation of the oats. *Instead of 1 cup rolled oats, you can also use 1/2 cup rolled oats + 1/2 cup ground buckwheat groats. Soak only for 7 hours total, otherwise buckwheat groats can break down the texture too much. *Learn how to make your own coconut butter here! 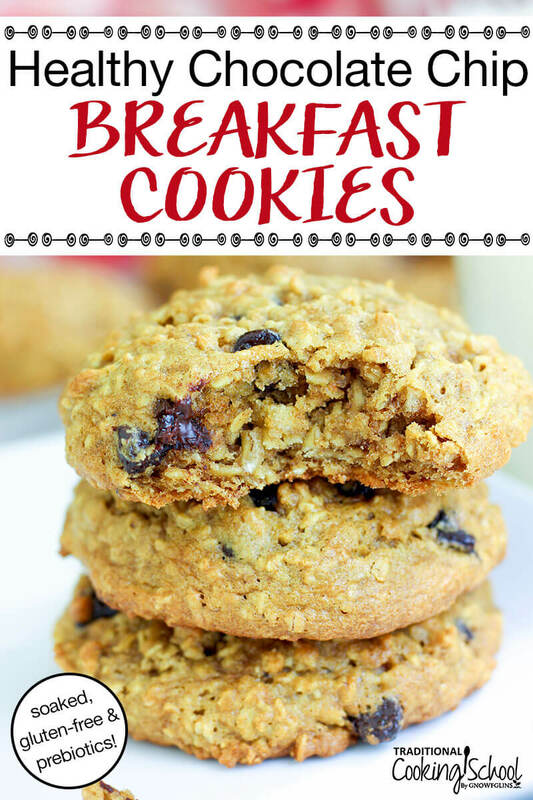 Do you like the idea of healthy cookies for breakfast? Are you more apt to enjoy these gluten-free breakfast cookies in lunches, snacks, or for dessert? What can I use instead of tiger nut flour? I moved from the US to Chile a few years ago. Tiger nut flour is not available here and is expensive to import.